A man can be known for the company he keeps and Nitish by associating himself with Lalu has tarred and feathered himself very badly. Nitish could have stood for elections on his own without partnering with the likes of Lalu and could have kept his dignity and image intact even without winning any election. In such a case, I would not have minded if either of these two (BJP or the JD(U)) had won. You would notice that even after breaking apart from the BJP, I always advocated Nitish to patch up his relations with the BJP and Modi. But unfortunately your hero continued on his self destructive phase after breaking apart from the NDA. As a result his name is sullied forever and there is no redemption left for him now. Caste combos matter more than image or dignity in Bihar. Mending fences with a now powerful BJP would have meant a very bad deal. So he went on to mend fences with Laloo. And remember my signature - In 1990, BJP was supporting Laloo Yadav!! BJP-led NDA will win 125 out of 243 seats in Bihar getting simple majority while Nitish Kumar-led coalition will manage only 106 seats if elections were held in the first week of September, according to a pre-poll survey by India Today group-Cicero ahead of assembly polls in the state in October. The survey shows significant gains for the BJP and its allies, and predicts losses for JD(U)-RJD-Congress combine. 'Others' have been predicted to get 12. The half-way mark in the assembly is 122. The Bihar assembly election could be "very, very close", according to the agency which conducted the poll. The survey pegs vote percentage of BJP-led NDA coalition at 42% and predicts that the JD(U)-led alliance will manage to win 40% of the votes. However, in a relief to Nitish Kumar, the India Today group-Cicero survey reveals that he is the top choice for the chief minister's post with 29% of voters in his favour. Waise to politics & dignity are mutually exclusive but Nitish became sickular (I.e. 'lost dignity') when he did the drama of seperation with BJP/NDA bcoz of communal Modi. But one of my bihari colleagues said almost exactly what you said - had he stood his ground without getting associated with lalu, it could have generated a positive sentiment for him. With lalu, even that is gone. In current assembly, rjd has 20-something mlas, jdu has 100+. But both are contesting 100 seats in the upcoming elections. Which means, he did not just associate with lalu, but went several extra miles. Modi ne ek saal mein 60 saal ka kaam undo kar diya lagta hai. This guy Minhaz Merchant is a brilliant column writer. His insights are very well put together and super informative. From a bipolar contest, the state is now a quadrangular affair which plays to the NDA's advantage by dividing the minority vote. The BJP has allocated 83 seats to its three allies (Ram Vilas Paswan's LJP, Upendra Kushwaha's RLSP and Jitin Ram Manjhi's Hindustani Awam Morcha). That leaves the BJP with 160 seats. Assuming its allies deliver a strike rate of only 25 per cent and win around 20 seats, the BJP will need to win at least 102 seats from its own quota of 160 seats to secure a simple majority of 122 seats for the NDA coalition in the 243-seat assembly. That translates into a required strike rate of around 63 per cent (102/160). The BJP had achieved a strike rate of 91 per cent on the seats it contested in the 2010 assembly poll - though, being in alliance then with the JD(U), the comparison isn't entirely valid. Nonetheless with a quadrangular contest, a strike rate of just over 60 per cent, compared to its earlier 91 per cent, seems achievable and possibly surpassable. 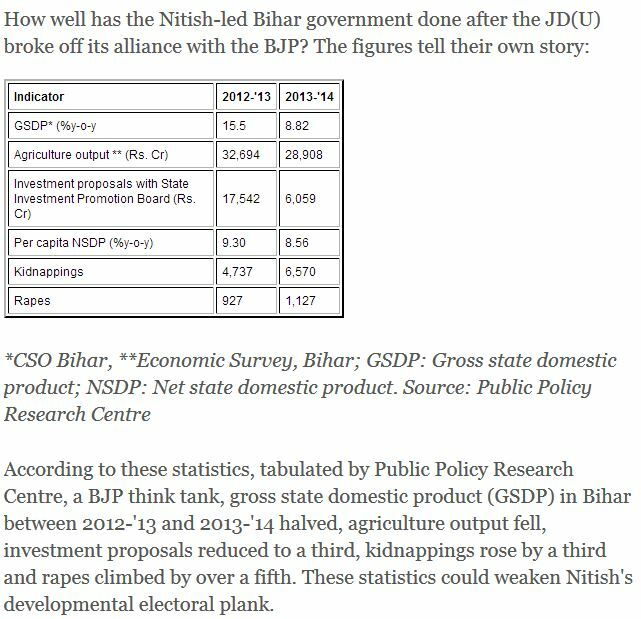 For Nitish and Lalu, the electoral math is more problematic. Each needs to win 60 of its quota of 100 contested seats, since the Congress with its cache of 40 seats could draw a blank. While Nitish may well win his share, a strike rate of 60 per cent for Lalu (which would mean taking his 2010 tally of 22 seats to 60) is a tough call. Mamata Banerjee today lost the bifurcation battle to rival Nitish Kumar after the Union Cabinet “unanimously” rejected her demand and flashed the green signal for the carve-up of Eastern Railway. The decision, taken after a two-hour meeting chaired by the Prime Minister, comes as a big snub to Mamata and is likely to snowball into a major confrontation between the National Democratic Alliance and the Trinamul Congress. 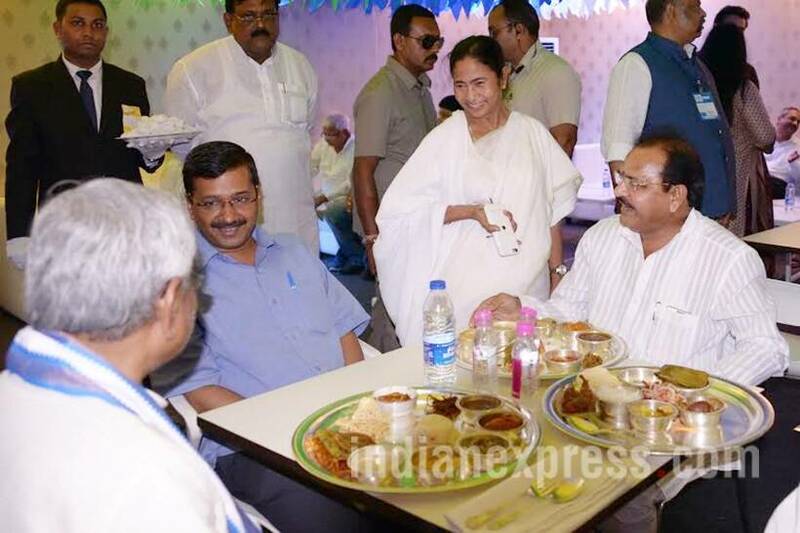 Mamata had been left hanging for a month since she demanded a stay on the bifurcation. Yes. When both 'Mumtaz' and Nitish were in NDA. Who is the guy in fatigues with a gun. Don't tell me these 2 have actually got some kind of a security. If I were the waiter in the black suit, I'd poison everyone's food.